I did not know much about global citizenship growing up. I grew up in a rural area in which pretty much everyone happened to be of the same race and celebrated the same cultural traditions. As a child, I did not fly on a plane to go on family vacations with my parents and siblings. Since my childhood was also before the internet was a thing, I didn’t know much about other countries unless I heard about them on the news (usually in a negative light), read about them in an encyclopedia or learned about them in school. That was my extent of global citizenship knowledge. I didn’t see myself as being part of anything outside of the community I was growing up in. Fast forward quite a few years later, I’m now a parent who loves traveling with my spouse and 4 children. Yes, travel can be costly, but I believe it is worth it! My family hasn’t traveled the world by any means. 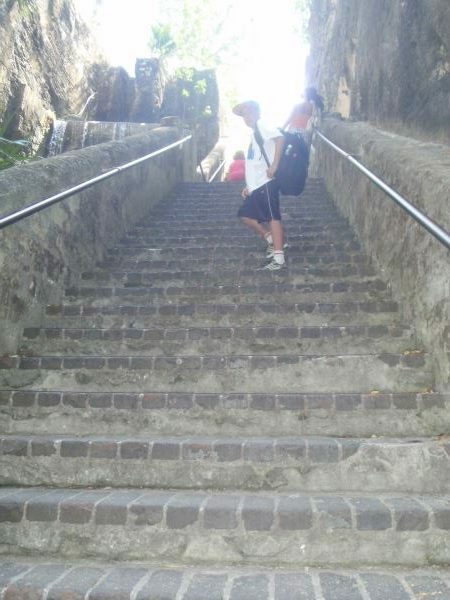 However, we do try to learn about the history and culture of the places we do travel to. For example, Nassau Bahamas doesn’t only have beautiful beaches and tropical weather. It also has a lot of history with the Arawak Indians, pirates, the Queen’s Staircase, slavery followed by the abolishment of it, and more. This past summer, we took our kids to the Oregon coast and explored the tide pools, became mesmerized by watching the gray whales, and ate some local chowder. We also explored Seattle, Washington. Two summers ago, it was Quebec City and Toronto that we toured around as a family. Each area has unique local food, traditions, and so on. There is so much to see and do everywhere we go! Each place we visit builds on my family’s sense of global citizenship. *Disclaimer: Downloads may contain affiliate links, helping me support my family at no extra cost to you. Thank you for your support! 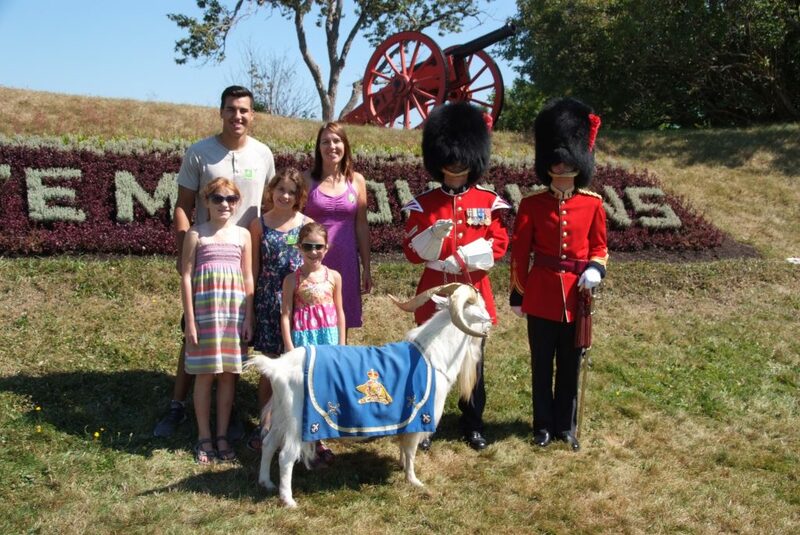 My kids and I are pictured above at our visit to the Citadelle of Quebec. Traveling builds empathy and an appreciation for other citizens of the world. It also gets us reflecting on our own traditions. In most cases, we come to the understanding that we are more similar to others than we may have previously believed. As most of us experience, it is impossible to physically travel as a family as much as we would like to. This is why I was so excited to come across Little Passports recently. Little Passports is a monthly subscription program in which those children near and dear to us receive a package in the mail each month. This program truly helps build that much-needed global citizenship within our children. 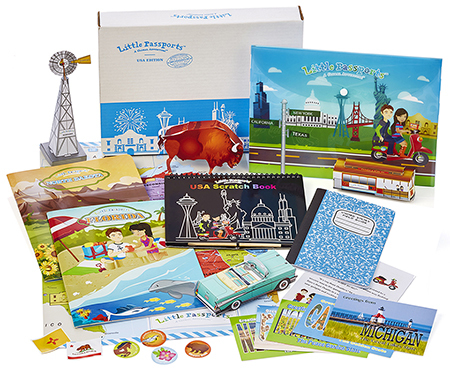 The initial subscription kit includes a suitcase, welcome letter, activity booklet, world map, and/or anything else relevant to the overall theme of the subscription kit ordered. Instead of physically traveling the world, a part of the world comes to you right in your very own home for you and your child to learn about and explore! Founded by two mompreneurs, Little Passports has age-appropriate activities and learning to offer for children ranging from 3 to 12. Kids love getting mail addressed to them. They also love engaging in physical, hands-on activities. 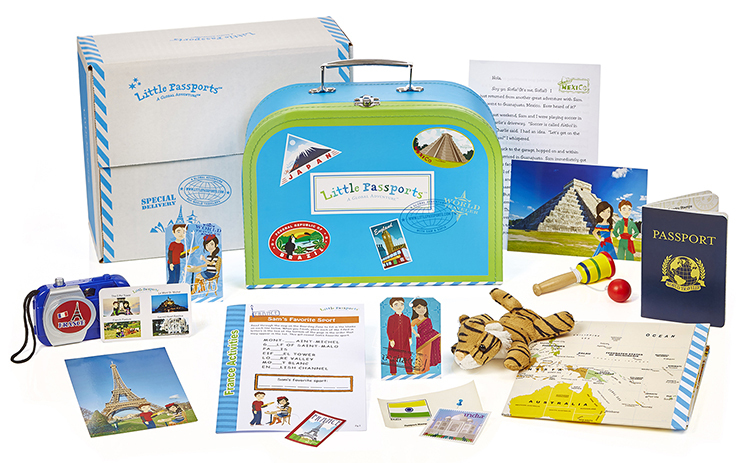 A subscription to Little Passports is a fantastic way to help build global citizenship in our children! To top it all off, Little Passports is currently offering a discount on all subscriptions! 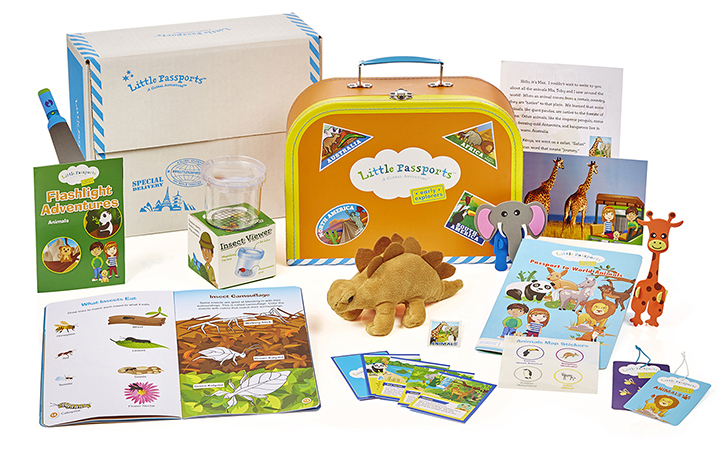 Early Explorers is Little Passports’ subscription program for 3 to 5 year-olds. A few of the fun themes include dinosaurs, music, landmarks, habitats, sports, insects, space, and transportation. Max, Mia, and Toby are the fun characters associated with the Early Explorers subscription kits. They initially come with a world map, passport and more. World Edition is Little Passports most popular program. It is for children ranging from 6 to 10 years of age. Kids discover a new country every month and are provided with relevant hands-on activities as well as souvenirs from that country. A wall-sized world map and passport are part of the initial set. Sam and Sofia are characters that go to the country of the month with the child. In addition to all of this, children can access online games in the Boarding Zone. A suitcase with luggage tag, activities related to the country and culture (Big Ben 3D kit for England, Pyramid activity for Egypt), recipes to make based on traditional food from the region are just a few examples of what a kit in the World Edition might include. Little Passports makes a great gift at any time of the year. This program has gotten each of my daughters excited. My older daughter loves to cook so loves the idea of new recipes to try from around the world. My 10 and 8 year-olds love hands-on learning as well as collecting little trinkets from various places. Little Passports is right up their alley! Amy Norman from Little Passports on WFLD-TV Good Day Chicago from Little Passports on Vimeo. Little Passports on KTLA from Little Passports on Vimeo. I love how the news anchor dad in the above video is so excited about participating in the program with his daughter. Little Passports has other options besides the Little Explorer and World Edition subscription packages. They also offer a USA Edition and Science Expedition options as well. In the USA Edition, children learn about two new states each month. This program is specifically designed for children aged 7 to 12. The initial kit includes things such as a wall-sized USA map, welcome letter, scratch book, and a scavenger hunt project. Ongoing packages include activity-packed State Journals, postcards, access to online activities and information, and more. 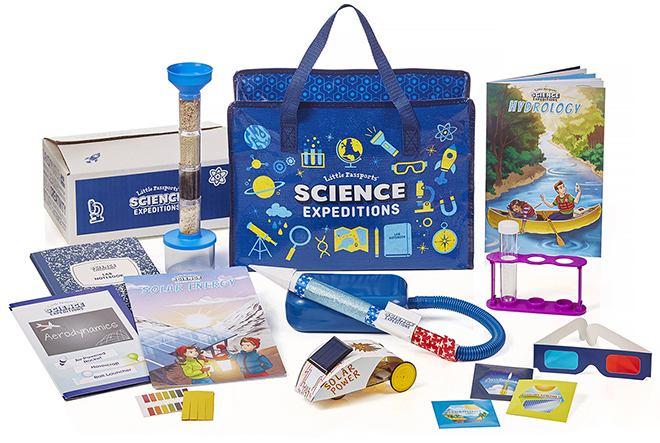 Science Expeditions is specifically designed for children 9 and up. The initial kit comes with a cute tote bag, notebook, a forensic science experiment kit, a fingerprint analysis card and ink pad, as well as a games and activity booklet. Kids are to solve a new mystery each month. What kid doesn’t love to perform hands-on science activities? I know mine do! 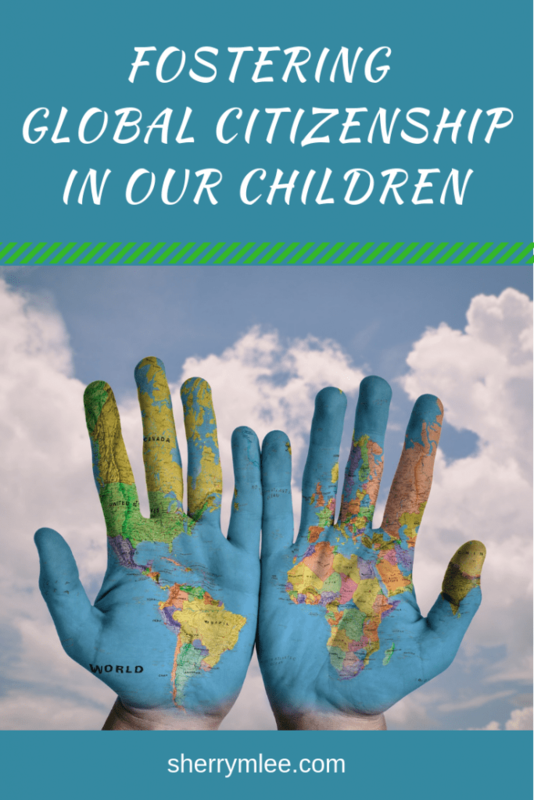 How do you foster global citizenship in the children near and dear to you? Please share in the comments below. If you enjoyed reading this, I welcome you to also check out my post about Gratitude for Safety and Freedom. Oh, how I would have loved that as a child! I grew up in a rural area too, and was lucky enough to have a full set of encyclopedia and parents who encouraged reading. I went traveling as soon as I could! I love this, I’ve been on airplanes since I was a baby and cannot remember a time when I didn’t have a passport. It is so important for people to learn about other cultures, I completely agree that traveling does build empathy and we so need that in the world right now. Thank you so much, Liliana! Building empathy is important for everyone. I love the Little Passports idea! I’m just sad that my kids are all older. We have had the opportunity to travel with our kids all over the world and I hope it has helped them be more open minded and caring people. But there are also many cultural festivities/opportunities in the cities that surround us that we could ‘travel’ to and enjoy, so being a global citizen doesn’t have to be costly or involve flying to foreign lands. Thanks for this fun post! I try to teach my children about global citizenship by reading books about children all around the world. We also sponsor two children. One is from Malawi, and one is from the Philippines. We write them letters, and cards, and we get mail from them as well. We have a world map on our homeschool room wall, as well as a globe on our book shelf. I know that it is not the same as traveling, but it is a start. So important to teach our kids that the world is bigger than our little corner. Great gift idea! We love little passports. It’s a great way to introduce children to different cultures. I think this is a great concept. I wish we could have traveled more internationally. It is so important for kids to understand and know about other cultures. I used to teach at an International School here in the States. The Headquarters were out of Lebanon, but there are schools around the globe. As a result, I taught quite a few international students whose parents had moved to the U.S. to work here. There were also students from the States as well. I loved our conversations about other cultures because elementary students are fascinated to learn about traditions done in other countries. This program looks like a very engaging and fun activity for kiddos! I definitely plan to travel all over with my kids! We are very fortunate to live in Florida so we’re close to so many cool things! I absolutely love this article! I think it is so important to expose children to different places and cultures. So many valuable lessons can be learned. We love traveling to Europe and I can’t wait to keep exploring with the kids!